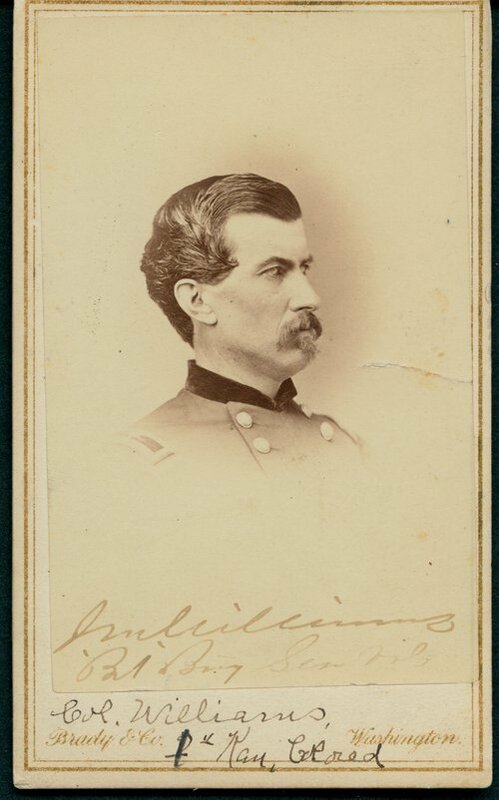 A carte-de-visite showing Colonel James Monroe Williams. At the beginning of the Civil War he was commissioned a captain and appointed commander of Company F, 5th Kansas Volunteer Cavalry. In 1862, he was resigned from the 5th Kansas, raised a regiment of black infantry, which became the 1st Kansas Colored Volunteer Infantry and became its colonel. In 1864, Williams assumed command of the 2nd Brigade, 1st Division, VII Corps and was brevetted brigadier general early in 1865. In 1866, after the Civil War, he entered the regular army as a captain in the 8th US Cavalry, serving as commander of Company I. He served with the 8th Cavalry based at Fort Whipple, Arizona and Forts Selden and Bayard, New Mexico. He resigned in 1873 and became a rancher in Colorado.